This well-worn plastic bag has been around for quite a while. It’s moved with me four times (from Texas to Ohio and back), carefully transported from apartment to house in spite of its sporadic use. In fact, the contents have been past their shelf life for some time, but I’ve held onto it with the intention of one day reverse-engineering the mixture inside. When I opened it a few weeks ago, I realized that not only could I easily identify all of its components, most of them were already in my pantry. If you don’t already have these ingredients and want to make a batch, I recommend shopping for them at ethnic markets– the quality is usually up to snuff but the prices are much lower. I scored a huge bag of cardamom pods from an Indian market for next to nothing, and most of the rest are from the section of my local grocery where the Mexican spices are kept (like this ginger). Cardamom is typically sold ground or in the pod– for this recipe, you’ll need to crush some of the brittle pods and pick out the little black seeds. 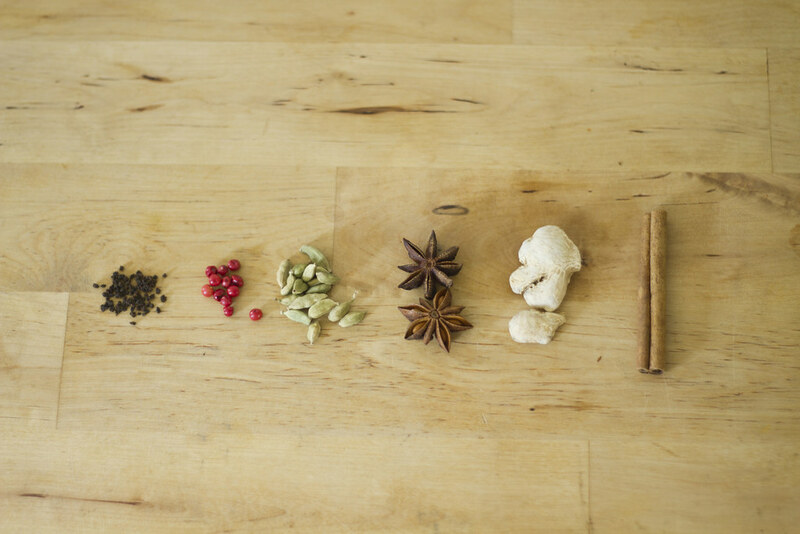 Break up the cinnamon sticks, star anise, and ginger with a mortar and pestle or a small food processor. Combine all ingredients, and shake in a fine-mesh sieve to remove small particulates. Store in an air tight jar in a cool, dark place for maximum shelf life. This batch filled a half-pint jar with a little left over. 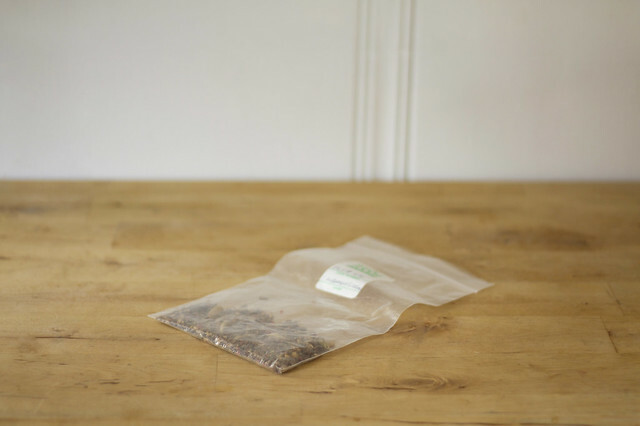 To brew a cup, fill a tea ball with a tsp or so of the tea. Put it in a mug filled with boiling water, and steep for five minutes. Remove and enjoy. 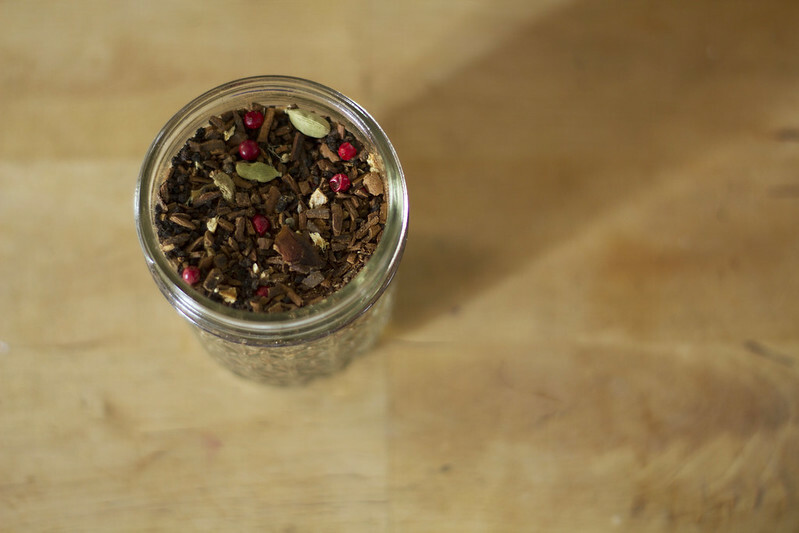 Note: The pink peppercorns are pretty mild, and contribute more to the appearance of the tea than the flavor. They’re not interchangeable with black peppercorns, so if you can’t find them, be sure to omit them entirely instead of making the substitution. A honey-sweetened mug of this tea is perfect on a chilly winter day, and a jar of this mixture makes an excellent gift for the host or hostess of a holiday party. If you make a batch, let me know what you think! I’m busy planning out my baking schedule and knitting at full speed over here, so I probably won’t be back until after the holidays. Stay warm, everybody. Posted on December 6, 2013 by Jessica This entry was posted in Food, Life. Bookmark the permalink. Thanks so much for this, I am always looking for good teacher gifts and I think this will fit the bill this this year! I do have something to report, but not what you think!